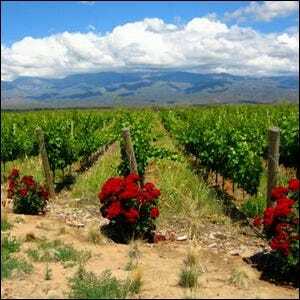 Abundant Rose Bushes in Grape Vineyards Serve What Purpose? Which Of These Foodstuffs Used To Include A DIY Dye Pack To Make It More Appetizing? Many a vineyard visitor has been puzzled by the abundant rose bushes scattered about the premises: roses at the end of the grape vine rows, roses along the perimeters of the field, and often roses up and around outbuildings. At first glance, it would be easy to write the copious roses off as a charming addition to the landscape intended to brighten the mood and paint the vineyard in a romantic light. While beautiful, the abundant roses serve a very important purpose. Roses are more susceptible to the fungi that cause leaf “rust” than the grape vines, so if the roses begin to breakout with a rust infection, the workers know to begin treating the nearby grape vines before the crop is adversely affected.